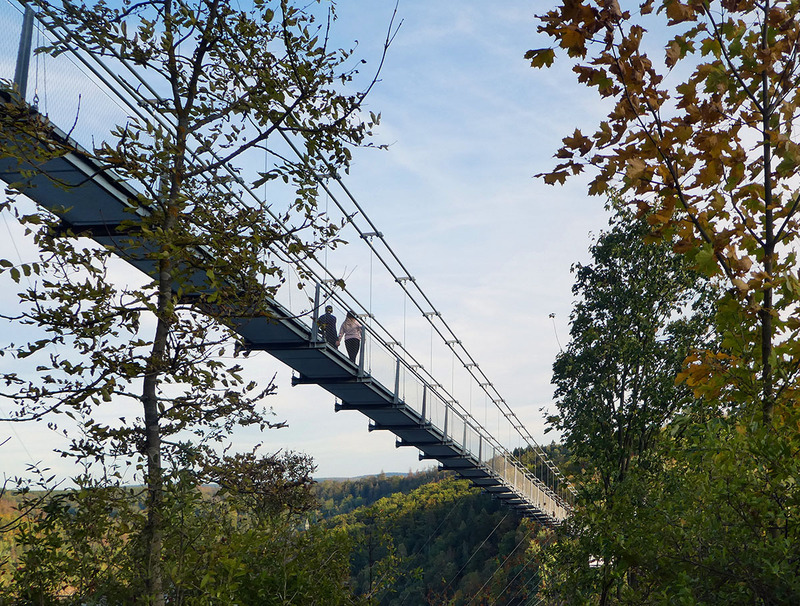 Looking for something really cool to do in a relatively undiscovered part of Germany? Then I’ve got just what you might be looking for. 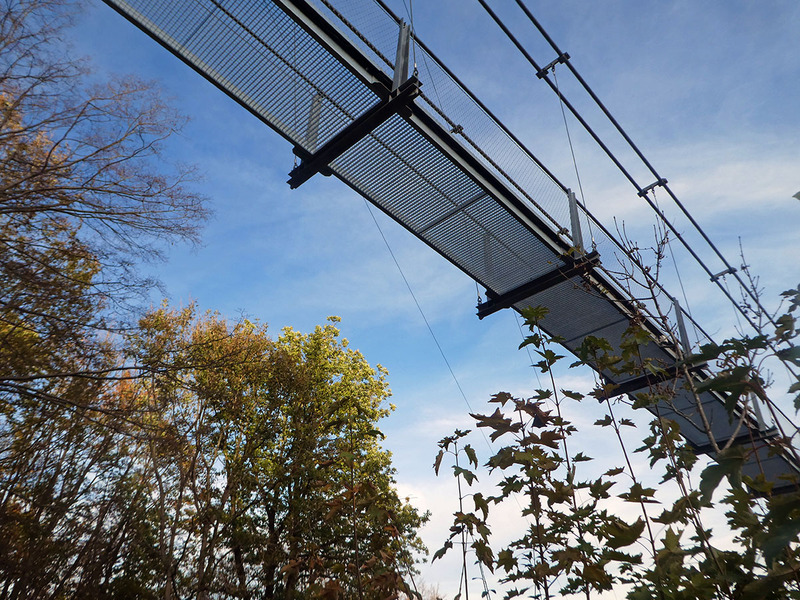 It is a visit to Titan RT, the longest swingbridge in Germany. A few weeks ago the German Tourism Board hosted me on a trip in the Harz Mountains, a relatively unknown area in the middle of Germany. The Harz Mountains are the highest mountains in Northern Germany and located withing a 4 hour drive of the Dutch-German border. 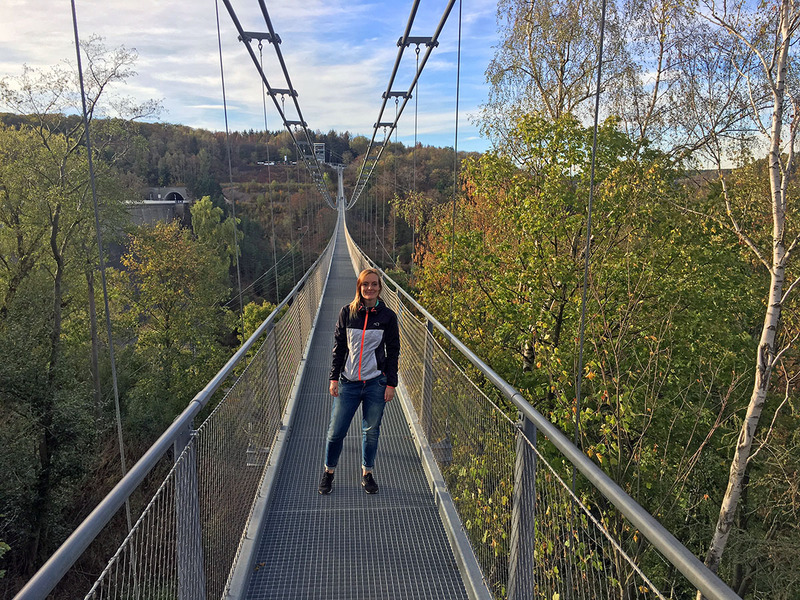 A few years ago I already visited the former longest swingbridge in Germany near Geierlay which is located in the Hunsrück area and was a lot of fun to experience. And so when I heard that I could visit Titan RT on this trip, I got pretty excited. 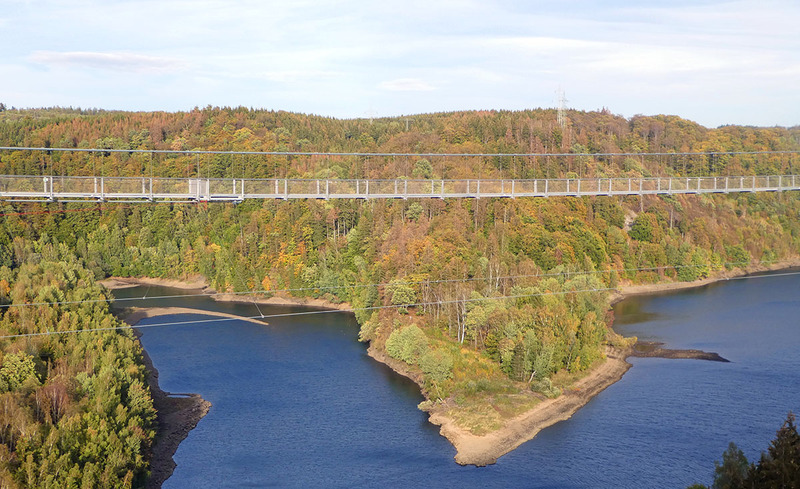 In this blog you will find all you need to know about Titan RT – the longest swingbridge in Germany. It’s a sunny afternoon in September when I arrive in the Harz. After checking into my hotel in Wernigerode, I drive over to Titan RT and the nearby Harzdrenalin Center. I can already see the bridge across the reservoir Rapbodetalsperre. Just like Geierlay it looks pretty cool and so I’m feeling excited. After parking my car I notice that it is quite busy. It makes sense though since it’s a sunny afternoon and summer seems to be nowhere near over. 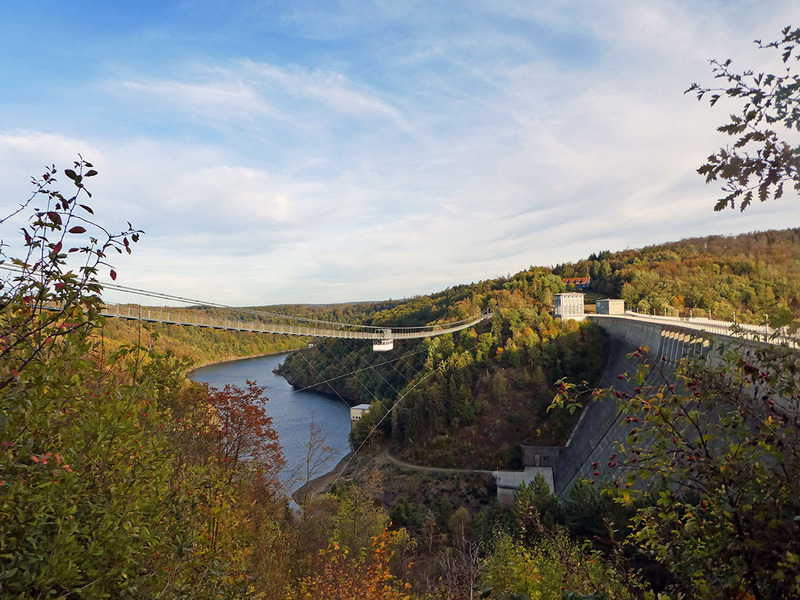 First I sign in at the Harzdrenaline Center desk, as later today I will make a ride with MegaZipline, a one kilometer long flight across the reservoir. After receiving my ticket I decide to walk over to Titan RT for a first glance. I notice you cannot access the bridge without paying and so decide to wait a bit longer until after my zipline flight, because then I’ll have enough time to walk across the brigde and take pictures. 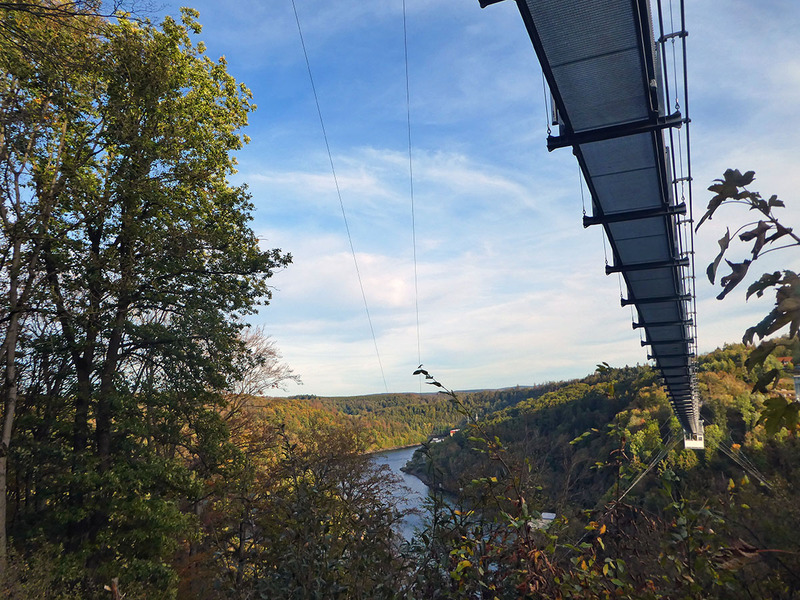 The Mega Zipline turns out to be an amazing adventure which I will tell you more about in one of my next blogs. In case you are curious already, make sure to check out the video I made on my Facebook page! After the zipline I buy a ticket for Titan RT and a miracle has happened because the bridge is almost empty. It’s 18.00 o’clock and I feel extremely lucky. 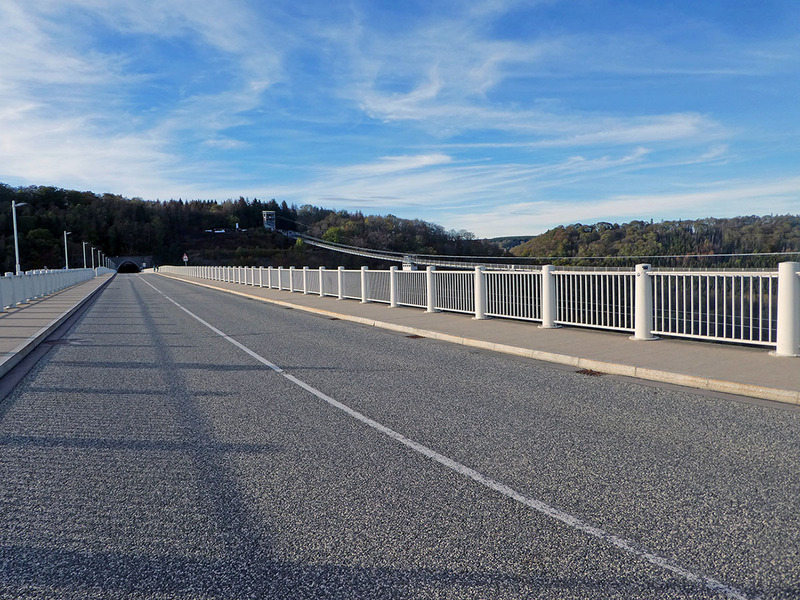 As there is almost nobody left on the bridge, I don’t have to pay attention to avoiding walking into other people. This has happened to me on the Geierlay bridge before. The first few steps I take pretty slowly as the wind has picked up and is swinging like a madmen. After finding some balance I also find the courage to walk on and within moments I’m in the middle of the Titan RT. The wind is quite fierce here and I almost lose my selfie stick (no shame!). At the same time my mobile phone stops working. Perfect as that makes it easier for me to enjoy the walk. I take some shots with my regular camera instead and walk towards the end of the bridge, while enjoying the views across the lake. Every now and then a zipliner crosses me above my head but other than that and the wind, it’s actually pretty quiet. Before I realize it Ive reached the end of the bridge. I look over my should one last time and notice that by now, the bridge is almost empty. WOW! I never imagined this to happen. A few moments later I pass through the gates and leave the Titan RT so I can make some photos from the side as well. As the sun slowly sets behind me I return to my car with another great experience in my pocket. 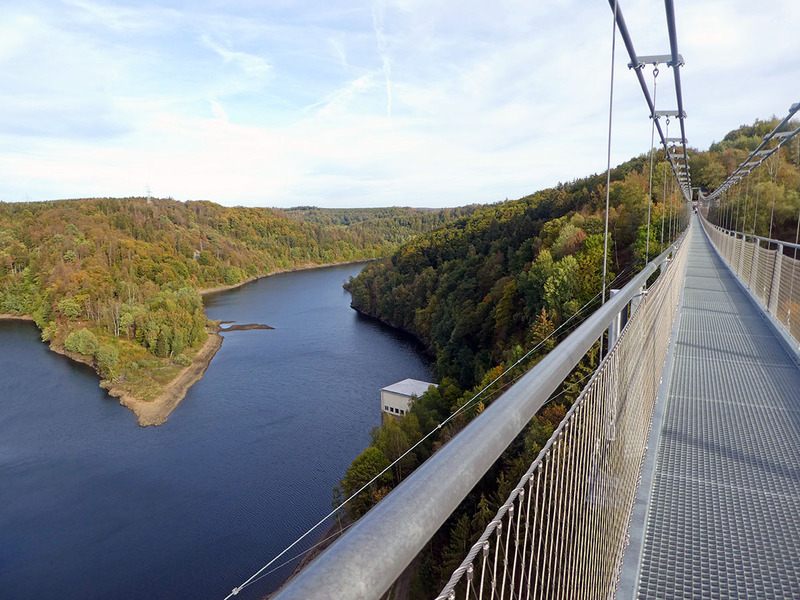 As I mentioned before, the Titan RT swingbridge is the longest swingbridge in Germany. 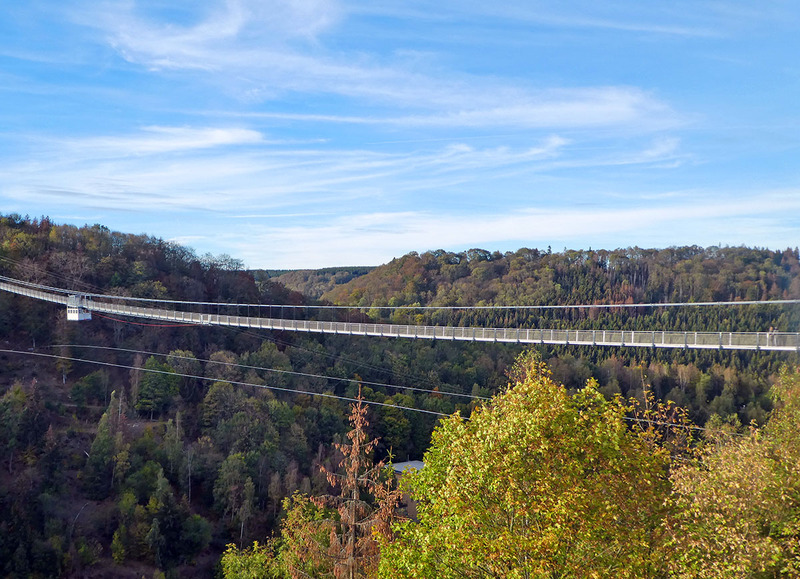 They say it’s the longest swingbridge of its kind in the world. Doing some research on the internet teaches me that it used to be the all longest one in the world for a short period of time, until a longer one in Zermatt, Switzerland was opened a few months after Titan RT was opened for public. 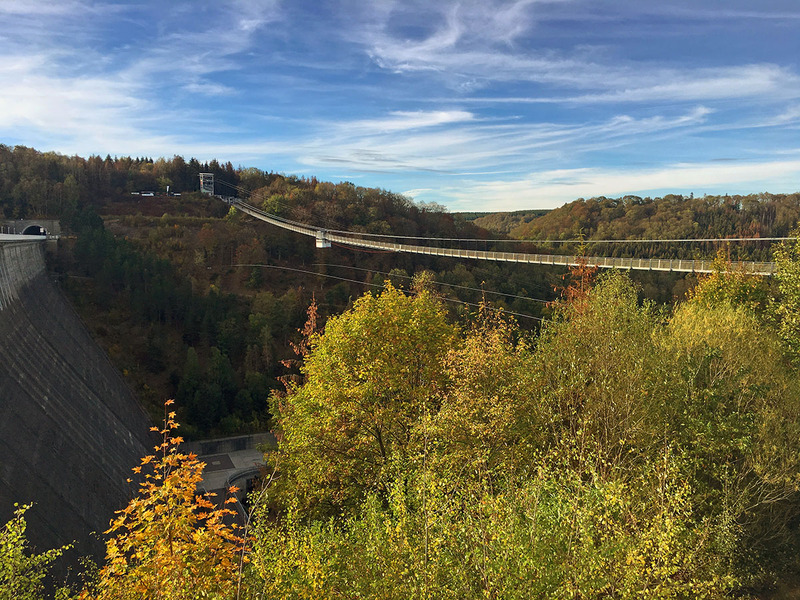 The Titan RT in the Harz Mountains is located at somewhat 100 meters above the Rappbodetalsperre reservoir and it 458,5 meters long, almost half a kliometer! The bridge was opened in spring 2017 and it took 10 months to build it. More numbers and technical facts can be found here. Where is the Titan RT swingbridge located? 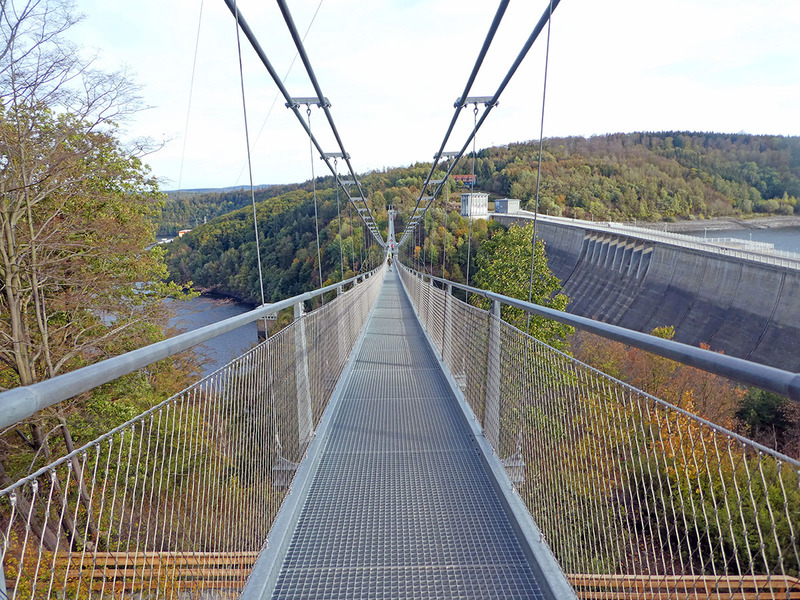 The Titan RT swingbridge can be found in the German Harz Mountains, near a small village called Stadt Oberharz am Brocken. The Harz Mountains are located some 4 hours driving of the Dutch/German border and can easily be reached by car. As it can get quite busy and parking is limited, make sure to come outside of the peak times, which are between 11.00 am – 4.00 pm. How much does a visit to Titan RT cost? An entrance ticket to Titan RT costs 6 euros per person. For this you can walk back and forth as many times as you want. Parking requires a 3 euro fee which you can park for all day long. Toilets are available at a small fee as well. 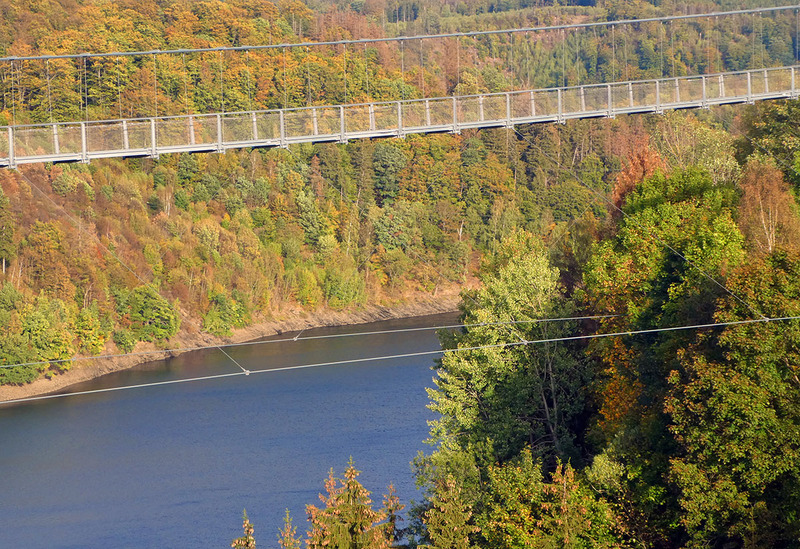 What else can you do in the Harz Mountains? The Harz Mountains are a great area to visit. It used to be a mining area and apart from Titan RT there are plenty of other fun things to do in the Harz, including the various activities of the Harzdrenalin Center. You can also make some truly nice hikes such as along the Harzer Hexenstieg (witch mountain trail) or you can climb Brocken, the highest mountain in the region, by train. If you are interested in visiting old towns, historical Quedlinburg is well worth a visit. The Harz offers a large variety of accommodation. I stayed in Hotel Am Anger, a charmning three star hotel in the historical center of Wernigerode, about a 25 minute drive from the Titan RT swingbridge. All accommodation options in the Harz Mountains can be found here. After reading this blog I hope I inspired you to visit Titan RT for yourself. 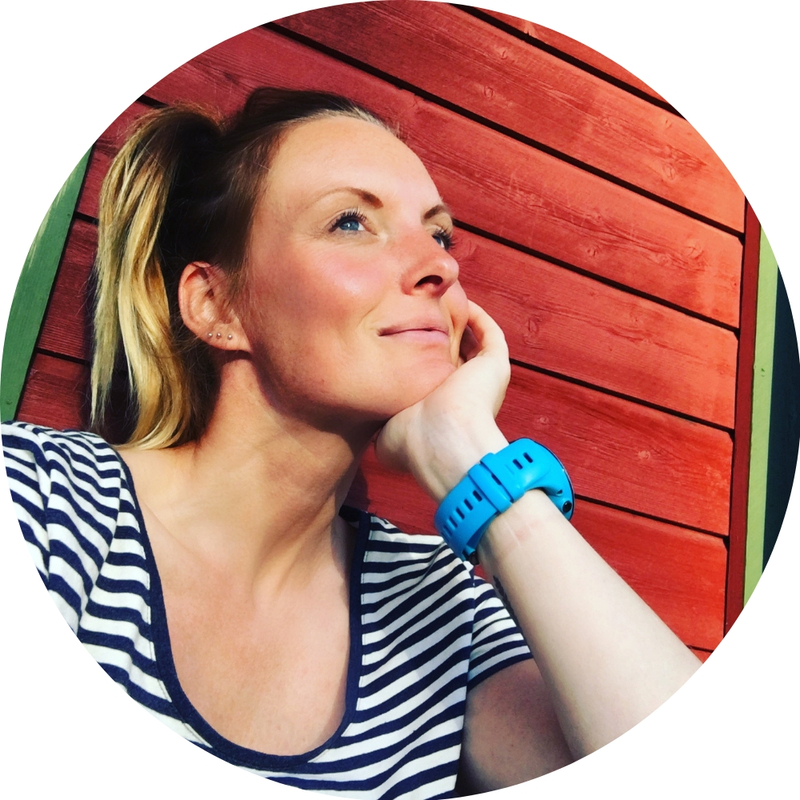 This blog was written in collaboration with the German Tourism Board. All given opinions are as always entirely my own. 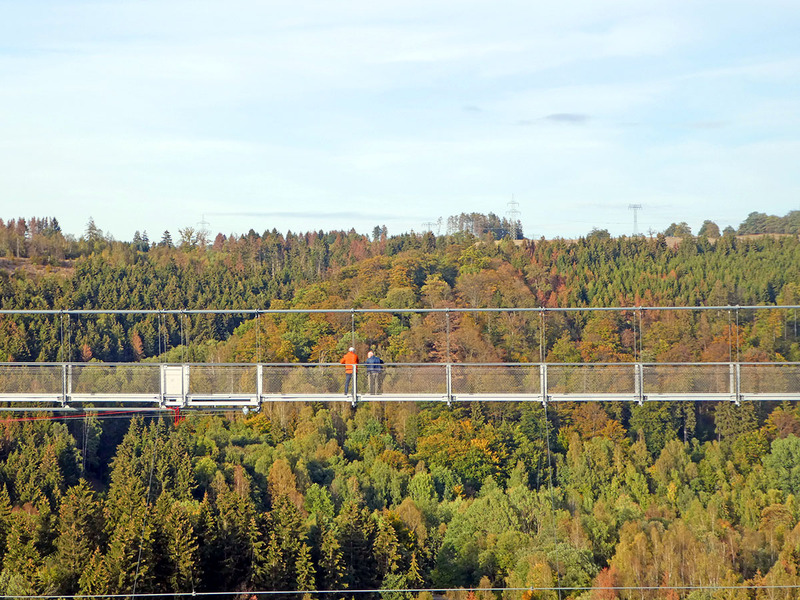 Those wishing to combine a visit to the Harz with a city trip can do so in Leipzig. Read fellow blogger Emiel’s blog about the best things to do in Leipzig here.